Hundreds of household workers, caregivers, factory workers are always in demand in Hong Kong and Taiwan. In Hong Kong, new contracts for household workers starting October 1 this year will be having a salary of not less than P25,000 plus an increase additional food allowance. 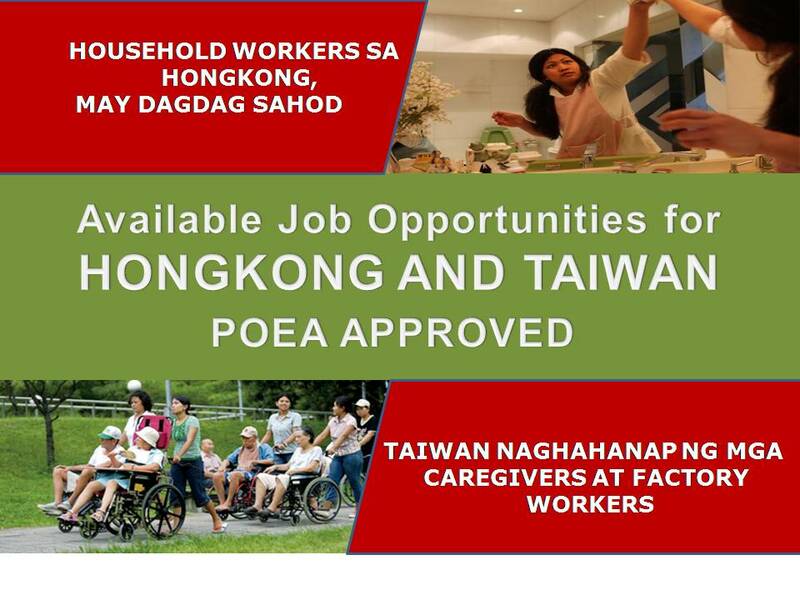 As of 2015, in Taiwan, factory workers, fishermen, and caretakers in care institution are enjoying not less than P28,000 per month salary while not less than P24,000 a month salary for domestic helpers and caretakers in homes as of 2015. Please be reminded that we are not a recruitment industry or we don't have any relation to the agencies mentioned here below. All the job orders was taken from the POEA jobs order website and was only linked to agency details for easier navigation for the visitors.